The Whirlygig and Tom Sepe are featured the the new Book "The Steampunk Gazette" by Barron's Press. Featuring tons of really great steampunk art and artists. I highly recommend you pick up a copy; best anthology I've seen on Steampunk yet! The Whirlygig will be on display as part of a wonderful exhibit feature Steampunbk art of all kinds. 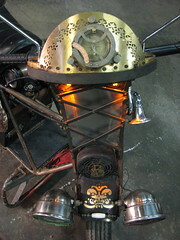 The Whirlygig was featured at the 1st annual Steampunk Form and Function exhibit, Charles River Museum Of Industry and Innovation in Waltham, MA. Thanks to Bruce Rosenbaum of Modvic for being a persistent and friendly pest. Thanks to the support of dozens of friends and some total strangers I raised $3000 in my Get The Whirlygig to the Mueseum Kickstarter.com fundraiser campaign, allowing me to transport the bike all the way across the continental U.S. and fly out to the opening of the exhibit! The Whirlygig made a second revolution and the 2nd annual Handcar Regatta in Santa Rosa and fun was had by all. The Whirlygig was seen whirlying around the San Mateo Maker Fair. The Whirlygig was featured at the 1st annual Handcar Regatta in Santa Rosa, Ca. I traveled there as part of the Ratchet and Rumble Crew - we built the Lumbering Contraption a giant human powered hamster-wheel hot-rod that runs on the railroad tracks! The Whirlygig traveled to San Mateo, California in May 2008 for the Bay Area Maker's Faire and recieved a Make Magazine Editor's Choice Blue Ribbon!. click here to go to the Whirlygig Emoto Flickr Image Gallery. click here to go to the "Making Of" Galery. Phil "Peef" Sadow for electrical assistance, Orion Fredericks for hermetic TIG welding, Sean Orlando for reality checking me and giving me the fire-extinguisher tank, and Andrew Jones for letting me stay an extra month in my old shop at XIAN Productions to get it all done! And last but not least, thanks to Michael Christian for teaching me so much about welding and metalwork and whimsy. Please also take a look at the STEAMPUNK TREEHOUSE! 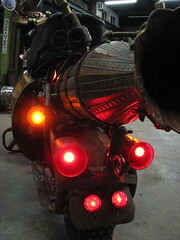 - a project I helped build for Burning Man 2008, and a major inspiration for my Whirlygig. 1) I've always wanted to build an electric vehicle, and a minibike is a very practical learning platform; its less expensive for all the components, it doesn't eat up your whole workspace, and its easy to reach into, get underneath or turn upside down without heavy equipment. Plus its just cute. Chicks dig it. Guys too. 2) Years of building large-scale Art Cars for the Burning Man festival taught me that I didn't want to be trapped in a box; no windshield, no doors, just full access for people to be able to engage and interact, yet still capable of toting a couple of passengers across the desert for adventures and necessities. Parking, transporting and storage and greatly simplified as well. 3) Falling in love with Steampunk. The monochrome Mad Max is soo 1990's, the Pirate theme is worn out (but we still love stripes! ), and although the Nouveau Circus movement is whimsical, it doesn't have the practical gear-headedness of the Steampunk aesthetic. So you get the romantic warmth of copper, brass and old wood, but the practicality of contemporary technical application... and heavy dose of whimsy & fictionality. The frame was donated to me by Lyell Cash, a fantastic catering chef I work with, which was buried in his garage for 40 years. Here's what the original must have looked like: I then transported it down to Lightning in a Bottle, a music and performance festival in Santa Barbara, and soon realized that it was underpowered and too small. It sat on the back burner for a year, until August 2007 when I spent a intense three weeks fixated on the realization of the vision. I began with inspirational research on the interweb - brassgoggles.com, steampunkworkshop.com, and numerous steam engine enthusiast's sites. [farm3.static.flickr.com] I'm lucky because there is a group of artists in Oakland called KSW - - that strives to collaborate and provide steam-power to kinetic sculpture. 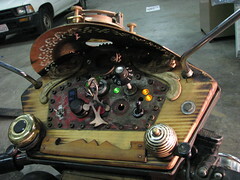 Sean Orlando and the Steampunk Treehouse crew upped the ante of aesthetics for me. I helped design and weld some of the branches for the treehouse while working on the bike, and the level of craftsmanship and creativity inspired me to take my art to the next level. And the more I worked on it, the better it got, and soon I realized that it deserved more and more of my energy to complete. For the week before Burning Man 2007 I was alternating working all-nighters and getting 4 hours sleep every other day. Under the "hood": The "pancake style" electric motor is a 15hp Etek, what conventional technologists would describe as a wave wound axial air gap brushed DC motor, and uses one-tenth the steel and one-half the copper as a conventional DC motor and is only half the size. This motor has been a standard in electric motorcycle racing and in certain configurations can reach speeds in excess of 60mph! Two 12Volt deep-cycle marine batteries wired in series provide the 24Volt power, which is managed by an ALLTRAX AXE 500amp controller, some 24V solenoids and a gaggle of knobs and switches that have to be triggered in the right sequence to prevent unwanted borrowing. The Tote Goat was a street-legal motorbike, and once I mount the license plate and deal with brake lights I should have no problem satisfying the DMV. As long as they don't actually look at it. 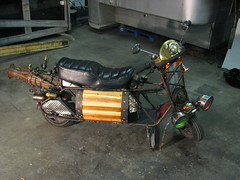 For now I ride it in a shroud of steam and jedi-mind tricks, and plan to show it off at the upcoming Maker's Fair in California. The heat to produce the steam comes from a hardware store bought propane torch, which has the added benefit of providing a jet of blue flame out the back of the bike. An unexpected boon was the resonant frequencies produced by the movement of hot air through the tube - giving the otherwise silent electric bike a mighty jet-powered sound. I also plumbed in a tiny "dead man's" steam whistle controlled by a small solenoid valve right off the boiler.